Recently the website www.noordverandert.nl published a video report of the conference Connected City & Public Space and the opening of the exhibition Noord Publiek on 17 october 2010. The video has been made by Bram de Waard. Today 200 fleece blankets were officially handed over to the Gère Paulussen Leefkringhuis in Amsterdam Noord. The blankets were gratefully loaned for the audience of the conference Connected City & Public Space, 20 september in the then already quite cold Storkhal. IKEA Nederland offered these blankets, with the condition that after the conference they would be donated to charity. This afternoon, Heike Löhmann, together with Sander Janssen and Pochun Huang of the organisation of Noord Publiek, gave the blankets to mr. P.A. Scheerder, director and founder of the Leefkringhuis. The blankets will be given to 200 families as part of their weekly food parcel. The Leefkringhuis in Amsterdam Noord is 26 years old and was founded to help children in the neighbourhood, who had problems at home and could therefore not be taken care of temporarily. The Leefkringhuis is run by a group of very engaged volunteers. They organise 24-hour reception and shelter for children, supervised homes, a food bank and ambulatory help. An exemplary organisation in Amsterdam Noord, deserving to be supported. ... Op 20 september is de tentoonstelling ‘Noord publiek’ geopend. Vier jaar lang hielden ruim 120 afstuderende architecten van de TU Delft zich intensief bezig met ons stadsdeel. Op de tentoonstelling zijn hun ontwerpen te zien voor 25 publieke gebouwen, van brede school tot dans- en theaterinstituut. Plekken waar mensen elkaar ontmoeten. Aan de opening van de tentoonstelling ging een symposium vooraf over Noord als volwaardig onderdeel van de stad. Over verbindingen, niet alleen via bruggen of Noord/Zuidlijn, maar ook op sociaal, cultureel en maatschappelijk vlak..."
On Thursday the 23rd of September the new mayor of Amsterdam, Eberhard van der Laan, visited Amsterdam North. 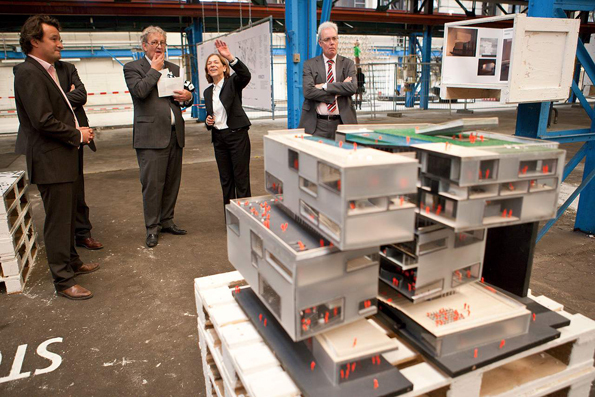 During this day he also paid a short visit to the exposition Noord Publiek – proposals for an undivided city. The mayor expressed that he thinks the exposition is ‘a good initiative’ and indicated he would come back soon to study the exposition in more detail. 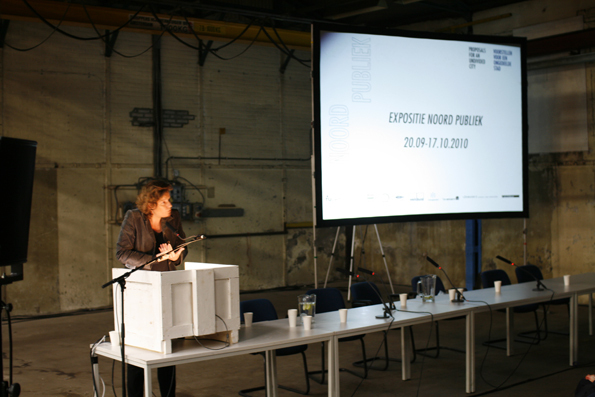 On Monday the 20th of September Carolien Gehrels, the municipal councillor of Culture in Amsterdam, officially opened the exposition Noord Publiek – proposals for an undivided city. The opening was the festive conclusion of the day that was filled in by the symposium Connected City & Public Space. During this symposium elaborate debates were held concerning the role of public spaces in the transformation of Amsterdam North. After her speech for a large and varied audience, Carolien Gehrels gave the starting signal for the opening, upon which the architectural models of the exposition were revealed.